Agrochemicals, such as pesticides and fertilizers, have facilitated an unprecedented intensification of agriculture [1, 2]. However, the desired yield gains come at the cost of unwanted side effects on the environment. Pesticides have been demonstrated to contribute to the decline of non-target organisms, such as bees, birds and aquatic biodiversity [3, 4, 5], fueling the global biodiversity crisis. This runs contrary to global efforts to protect biodiversity and, in particular, also to the aims of the European Union’s (EU) pesticide regulation . Consistent exceedances of regulatory thresholds  and revisions of authorizations of pesticides, such as of neonicotinoid insecticides in the EU by the Standing Committee on plants, animals, food and feed (PAFF Committee), also attest to deficiencies in regulatory pesticide risk assessment and management. Safety factors (also called assessment factors) that account for uncertainties in the extrapolation to real ecosystems. If the predicted exposure exceeds the safe concentration (as is the case for 2/3 of insecticides ), a pesticide can still be authorized if the producer can show through further data that its environmental and human health impacts are acceptable . This is formalized as a tiered framework that extends the standard toxicity tests (first tier) to more complex scenarios (higher tiers) . Higher tiers integrate processes and characteristics occurring in natural ecosystems, such as multi-species semi-field test systems in the EU, as well as reduction of exposure through mitigation measures in risk management . The tiered framework relies on two assumptions: (i) the first tier provides an overly protective measure of potential effects in the field; (ii) the higher tiers provide more ecologically relevant predictions of field effects or of concentrations that do not lead to unacceptable effects. Therefore, despite being rewarded with lower safety factors, they are assumed to still be sufficiently protective (Fig. 1). However, the widespread and well-documented occurrence of adverse effects in the field when authorized pesticides are applied (e.g., [3, 4, 5, 12, 13, 14, 15, 16, 17, 18]) questions these assumptions. Ecological context, i.e., the ecological properties such as sensitivity and functions of organisms and the composition of organism communities of the whole ecosystem to be protected. Landscape context, i.e., the situation in which the ecosystem is embedded. This comprises general environmental conditions, e.g., habitat type and climate, and site-specific aspects such as the connectivity to other sites and presence of additional stressors. Management context, including the farmers’ use patterns partly as prescribed by governmental risk managers, e.g., minimum spraying distance to field margin and sequence of pesticide use, that determines the potential occurrence of mixtures of compounds in soils and water bodies, which may exacerbate risks. Integrating these factors into test systems and models represents a formidable challenge—given that increasing the complexity of test systems comes at the cost of lower reliability and that the models are still in their infancy. As long as a scientifically validated prediction framework has not been established, we suggest procedural and institutional changes for the authorization of pesticides in the EU to narrow the current gap between the intention and reality of protecting biodiversity. The suggested changes are organized in stages (Fig. 1), the implementation of which requires increasing structural adaptation of the current framework and time frames. They are tailored to the EU process but can also inform regulation in other regions. We suggest an increase in safety factors by a factor of at least 10 for all tiers (cf. [7, 23, 24]) to cover uncertainties arising from the ecological, landscape and management context and to align predicted and observed effects in ecosystems. Moreover, the authorization process should be comparative, i.e., compare the risks of a pesticide product to already authorized products, and include a cost–benefit analysis. The comparative assessment would allow for weighing options, for example, authorizing the product with the lowest environmental side effects . The cost–benefit analysis would compare the costs of potential yield losses to environmental quality benefits. Although quantification may prove elusive for new compounds, minor reductions in yield losses at the cost of further deteriorating the environment would suggest that the product fails the cost–benefit analysis. Such developments could be complemented by novel insurance methods that protect farmers from crop failure to reduce the reliance of farmers on pesticides and to avoid that farmers carry the main burden of the suggested changes in risk assessment main burden of the measures . Implementation of these measures would only require relatively minor adaptation of national and European legislation, such as the Commission regulations 1107/2009 and 546/2011, and related guidelines provided by EFSA (e.g., ), which should subsequently be adopted quickly by the European Commission (as an example for a slow adoption see ), and could be achieved within several months to years. If a pesticide was authorized based on this framework, the rate of exceedance of regulatory thresholds would strongly decrease in most or all landscapes, enhancing environmental safety . Implementing stage-1 measures may result in risk assessment that is overprotective in some landscapes. Regulation that more efficiently balances the different ecosystem services (e.g., crop yield, pure drinking water, biodiversity) can be achieved by substituting higher tiers with a provisional authorization. This acknowledges the limitations in predicting (ecological) real-world effects and is guided by the principle of pharmaceutical regulation stipulating that a general-use authorization is only granted after passing trials under real-world conditions. 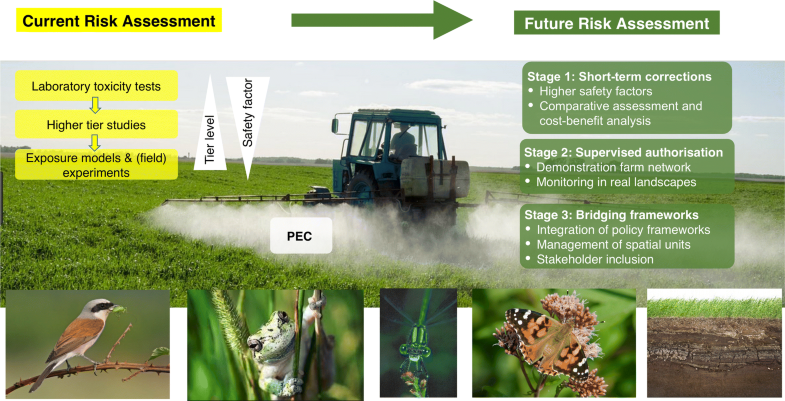 Calls for post-registration monitoring [25, 29, 30] and pesticide vigilance  point in a similar direction, but need to be tied to the concept of reserving landscapes and catchments for the purpose of pesticide risk assessment. In these test landscapes and catchments, which should be selected to represent a range of typical land uses, information that is typically non-disclosed such as the farmers’ use patterns in terms of dates and doses should be available for the risk assessment. The provisional authorization would require monitoring the fate and effects of pesticide products in these landscapes and catchments, and the final authorization decision would be made in light of the monitoring. Implementation would come at comparatively minor costs as the monitoring could be expanded from the environmental monitoring that is already mandatory in all European member states, and is also conducted in other regions, such as the Japan, Switzerland and USA. In addition, the applicant for an authorization could bear a major part of the costs for the expanded monitoring (but the economic implications particularly for small and medium enterprises should be borne in mind). In Germany, a network of demonstration farms for integrated pest management has been established that provides a starting point for farm-scale real-world monitoring of the fate and effects of new pesticides, as well as of the consequences of risk management measures such as field margins. This would need to be expanded to catchments and consequently consider ecological, landscape, and management contexts. The results would make it possible to validate chemical fate and ecological effect models for prospective risk assessment. Once validated, the risk assessment would be based on these models, replacing the supervised provisional authorization. Implementation of this authorization procedure would require far-reaching adaptation of regulations and subsequently the development of EFSA guidelines with fast adoption by the European Commission, as well as the establishment of a European demonstration farm network covering different climatic and land use scenarios, ideally under the auspice of EFSA (see previous section for examples of regulations and guidelines and see the draft guideline for veterinary pharmaceuticals as an example for the integration of monitoring ). EFSA‘s recent considerations on an improved environmental risk assessment of pesticides, e.g., including the landscape and management context (see above), support our demand for a revision of guidelines . Nevertheless, such adaptations may take years to a decade. Risk management decisions under the current framework are made with a narrow focus on poorly defined protection goals [25, 33]. In addition, an integration of different policy frameworks, such as those related to nature conservation, water protection, climate protection and agricultural production, is missing . We suggest that a future pesticide regulation framework be integrated into an overall environmental policy framework. Such a framework can build on the cross-compliance principle, which provides direct payments for farmers who maintain their land in good agricultural and environmental condition. A unified guidance and an authorization process by governmental risk managers that consider the requirements of different regulations for biodiversity and populations of species are urgently needed. Irrespective of how the acceptable levels are set, enforcement of these levels would require management of regional domains, which might entail elements of conservation management, such as land sparing, and stakeholder input . For example, highly pesticide-intensive agriculture could be compensated for by setting aside land to buffer the overall toxic exposure in the domain. This means that some side effects would be accepted locally, while the biodiversity targets for the entire domain (landscape types including catchments) are still met. Managing the side effects in these spatial domains could be organized analogously to successful other mitigation measures, such as cap and trade schemes, e.g., for sulphur dioxide in the USA and for carbon dioxide in California . Farmers could trade the pesticide emissions, where total emissions of toxicity equivalents would be defined for the spatial domain in addition to maximum residue levels for the crop, ensuring that the ecological and human health targets are met. This requires the adoption of a novel framework and related institutional changes that may take at least a decade, where the implementation may be guided by agro-environmental indicator schemes (e.g., ). Adopting the suggested changes to current risk assessment not only offers the option to substantially improve our understanding and mitigation of pesticide risks, but also would provide opportunities to combine different measures of land management, including crop rotation and field sizing. If agro-environmental indicators of risk for biodiversity and ecosystem services were defined clearly, stakeholders including industry, political authorities, farmers, and conservationists, would be empowered to improve their local environment by means most suitable for them . This could entail structural improvements for ecosystem connectivity, reduced pesticide use, creation of refuges, and other measures [26, 39]. Eventually, a more realistic risk assessment process should include all stakeholders’ interests through cooperation to meet their common needs and values. No economic profit can be more valuable than sharing the responsibility for sustaining society’s indispensable life support system while providing sufficient food, clean air, and drinking water. Key to this is healthy ecosystems—and the services provided by a diverse community of plants, animals and microorganisms. Conceptualization: AS, MRN; investigation: RBS, ML, RA, JF, MRN, AS, MS; visualization: HH, RBS, MRN, AS, JF; writing—original draft preparation: RBS, ML, AS; writing—review & editing: all. All authors read and approved the final manuscript. The authors acknowledge comments on the manuscript by two anonymous reviewers as well as Jason Rohr, Juliane Hollender, Ralf Schulz, Paul van den Brink, Inge Werner, Jörg Römbke, Francisco Sanchez-Bayo and Ben Kefford who helped to improve the manuscript. Moreover, the authors acknowledge the Leopoldina workshop participants contributing to the discussion: Christian Anton, Detlev Drenckhahn, Tobias Frische, Mark Gessner, Detlev Drenckhahn, Maximilian Hempel, Janet Hering, Wolfgang Köck, Werner Kratz, Ernst-August Nuppenau, Bernd Stein, Henning Steinicke. 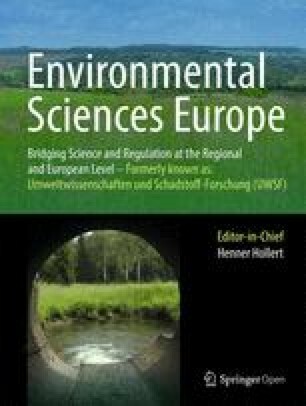 HH is the Editor-in-Chief of the journal Environmental Sciences Europe in which this article is published. The authors declare that they have no competing interests. The paper evolved from a workshop funded by the German National Academy of Sciences Leopoldina.